“Through powerful images and empowering messages, Love, Loss, and Laughter: Seeing Alzheimer's Differently offers a glimpse of Alzheimer's disease through an important new lens. This groundbreaking book provides honor, respect and dignity to people living with dementia and delivers comfort, support and understanding to their caregivers." Cathy Greenblat is a woman on a mission. She wants the world to know that the deeply forgetful are whole persons. She accomplishes this mission through a series of powerful photographs that are being exhibited around the world. Next up London March 5-16 at the North Cloisters Gallery. This coincides with the 27th International Conference of Alzheimer's Disease International (ADI). Then on to Switzerland in April. See the details below. If all goes well some of you will be able to catch me along with the exhibit, and speaking at a Symposium in New York city late in April. Details on this later. Here is the best part. 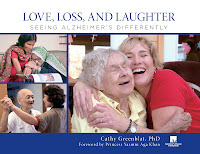 For those of us that can't make it to one of the exhibits, Cathy has written a book, Love, Loss, and Laughter: Seeing Alzheimer's Differently. Follow the link to check it out, or click on the book cover. London, UK, 5th March 2012: A travelling exhibition capturing moments of joy and sorrow in the lives of Alzheimer’s patients, opens this week in London and challenges how we view this debilitating condition and the people who suffer from it. The collection of moving photographs by Professor Cathy Greenblat, titled LOVE, LOSS, AND LAUGHTER: SEEING ALZHEIMER’S DIFFERENTLY, is being held at North Cloisters Gallery, University College London, Gower Street, London WC1 6BT from 5th – 16th March to coincide with the 27th International Conference of Alzheimer’s Disease International (ADI). Endorsed by ADI, the exhibition showcases powerful images depicting people with Alzheimer’s living meaningful lives at every stage of the disease: engaging with friends and loved ones; singing and playing musical instruments; preparing meals; getting dressed up for a day on the town; interacting with pets; or simply enjoying a serene moment of contemplation. The selected images were taken in homes, memory clinics, day programs, and residential centers in the United States, Canada, Japan, France, India, Monaco and the Dominican Republic. The exhibition is sponsored by Nutricia Advanced Medical Nutrition, a healthcare division of Danone. Cathy Greenblat, who lost her maternal grandparents and mother to Alzheimer’s, uses her evocative images to show that people with Alzheimer’s who are treated as whole human beings in positive environments can still give and receive great love, and share moments of hearty laughter. Central to her approach is the recognition that low expectations of people living with Alzheimer’s often make their disabilities worse. This collection of striking images establishes Professor Greenblat as both an accomplished artist and a powerful advocate for people with dementia. Cathy Greenblat’s pioneering cross-cultural photographic project (comprising more than 100 images) is also gathered in an important new book with a moving foreword by Princess Yasmin Aga Khan and commentaries from 40 interntional contributors. Each image is accompanied by the photographer’s captions. Her text in the 9 chapters of the book is enriched by thoughtful quotations from a variety of care partners as well as people living with dementia that present a wealth of practical upbeat information and advice. The book will be a companion to the exhibition that has been touring for the past year to prestigious venues in locations worldwide including Washington D.C., Toronto, Glasgow, Madrid, Salamanca and 10 cities in India. The exhibition will next be displayed at the World Health Organization Headquarters and The United Nations Building (Palais de Nations) in Geneva, Switzerland in April 2012. The exhibition and book are essential for everyone living with a diagnosis of dementia or caring for a friend, family member or client with the condition. Professor Greenblat hopes her evocative photographs will help reduce the fear and stigma that surround dementia, and demonstrate to those who care for people living with Alzheimer’s how to better integrate love and laughter into their daily routine.